I hate ironing as I have stated time and time again. However, I am in love with a fabric steamer. We received one for our wedding registry many, many years ago. It's bulky and doesn't work quite so well therefore I was excited to put the Epica 1500 Watt Fabric Steamer to the test. It was fairly easy to put together in that you just need to connect the poles (Kenzie did it!) and clip on the hook. After filling the 40 oz. water tank and plugging the unit in, it was ready to de-wrinkle in no time. Seriously, it took just 45 seconds to see the steam coming out. It is recommended to use de-mineralized or distilled water to avoid mineral build up inside the tank and hose. I love that this steamer is pretty compact and easily maneuverable from room to room as it is on caster wheels. The 4.3 ft hose has good reach for clothing, drapes, cushions, etc. 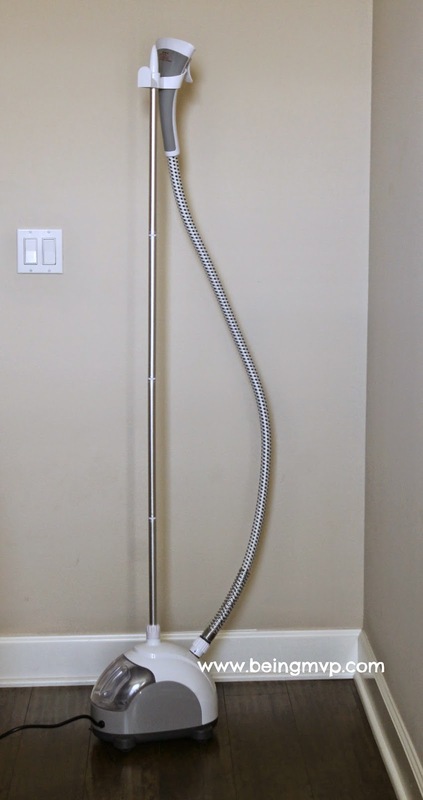 The pole is also adjustable in height (up to 51") for efficiency which is a nice feature. In no time at all, my super wrinkled shirt (out of shopping box) was smooth and ready to wear. This is an awesome, compact steamer that is super affordable and a must have for people who dislike ironing but want to look polished without wrinkles! 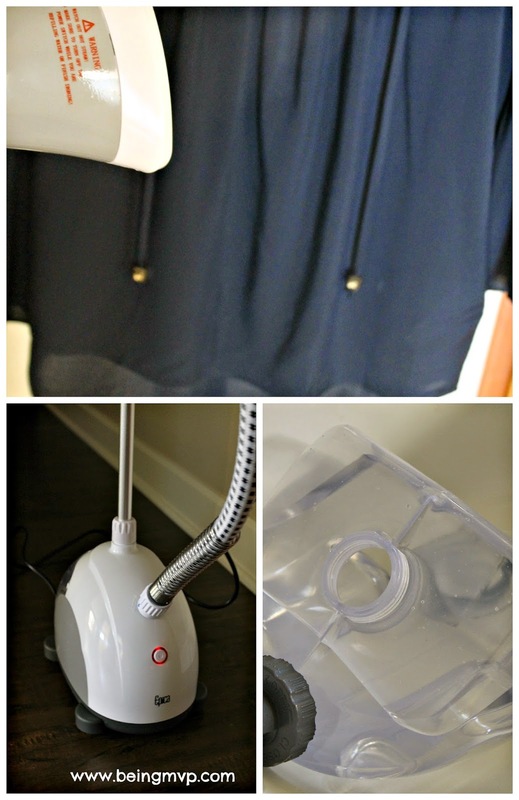 Have you tried using a fabric steamer? 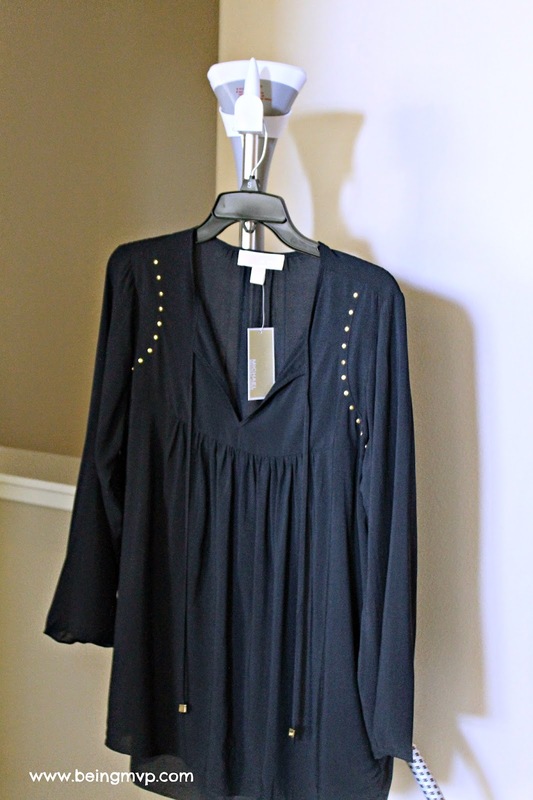 What do you think about the Epica Fabric Steamer? I hate ironing, so this steamer would be great for getting out wrinkles. Love it!! I'll have to put this on my Christmas wish list! I had a steamer before but burned my fingers a lot. I never tried gloves, that would have helped. We own a steamer and it's the best thing we've ever purchased! So much easier and faster than trying to iron! How many minutes of steam does it deliver per filling?